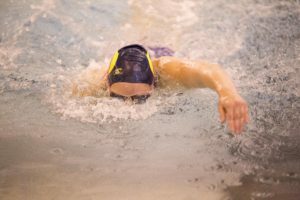 The DePauw University men’s and women’s swimming and diving teams had split results against Albion College and Washington University in St. Louis this past Saturday. Both Tiger teams beat Albion and fell to Washington-St. Louis, transitioning to 1-2 on their seasons. The men’s team, ranked 13th in Division III, powered over Albion with a score of 175-122. However, they fell short to seventh-ranked Washington-St. Louis 195-93. The women’s side, ranked 16th in the nation, also topped Albion with a score of 164-117, but lost to 199-93 to Washington-St. Louis. Junior Kurt Swieter had an impressive weekend, collecting two wins for the Tigers as he finished first in the 200-yard freestyle (1:43.72) and the 500 free (4:47.0). Additionally, he placed second in the 100 free (48.00). Junior Mitch Davis placed second in the 100 breaststroke (59.67) and the 200 breast (2:01.26). First-year Charlie Bates also nabbed silver in the 1,650 free (16:59.49) followed by teammate junior David Freund who earned third (17:21.64). Junior diver Eric Addy placed third in one-meter diving (247.45 pts) and fifth on the three-meter board (203.60). Standout senior Angela Newlon set a pool record and NCAA “B” time finishing with a time of 4:33.28 in the 400-yard individual medley. She also earned gold in the 200 butterfly (2:08.72). “It is really encouraging seeing fast swims in season to prepare the team for the bigger meets coming up,” said senior Kirsten Olson. Sophomore Mary Woods brought in another win for DePauw, touching first in the 200 breakstroke (2:30.24), while first-year Shelby Whitt placed second in the 1,650 free (18:38.63). Senior Annie Graves, Woods, Newlon, and first-year Olivia Neff came together for a 200 medley relay, earning second with a time of 1:51.19. The 400 free relay of senior Ellen Riehle, Olson, first-year Allison Lund, and Woods came in second as well at 3:43.68. Sophomore Elaine Davis placed second in one-meter diving with 216.30 points. Despite the loss to Washington-St. Louis, Woods was not deterred and optimistic for the rest of the season. The home meet was the first for women’s head coach Shea Davisson who was hired in August after former coach Ben Hewitt resigned. The men’s team competes at Wabash College on Friday, Nov. 4, while the women pick back up on Nov. 18-20 at the Phoenix Fall Classic hosted by the University of Chicago.